Trickster Orchestra unites superb soloists in a collective of transcultural avant-garde music. 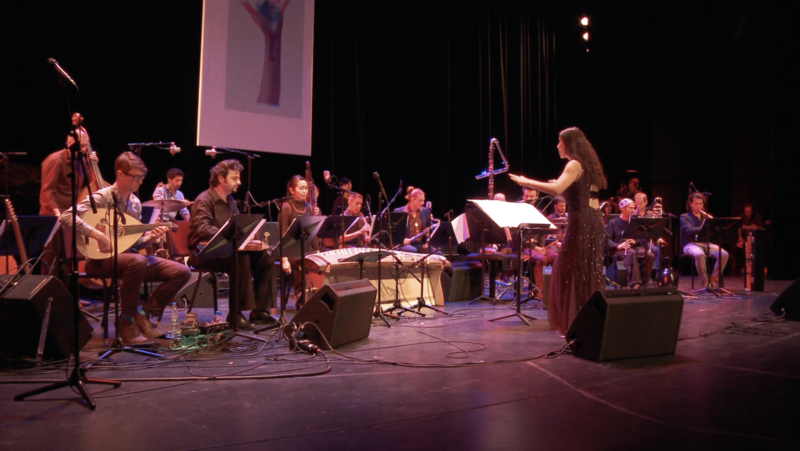 Under the artistic direction of Cymin Samawatie and Ketan Bhatti, the Berlin-based orchestra incorporates traditional instruments from Europe, Western, Central-, and East Asia as well as younger instruments such as electronics into a shared, contemporary musical language. One of the most exciting contemporary orchestras in Europe. Transcultural music beyond the comfort zone. Instruments that have never been combined to play together before. Music beyond any cliché, tremendous voices, timeless sounds. Venturesome new windows for free improvisation in orchestral pieces. Tutti parts welter through the concert hall like the organism of a caterpillar made of sound. A beautiful example of the poetic power of integration. Cymin Samawatie shows how intercultural dialogue and harmonic communality can work despite differences. A very honest attempt to do something with integrity. Improvisations that become an intercultural sound experience. This connecting approach of jazz could be a path out of political crisis. Trickster has musicians of different backgrounds discover a common language with jazz at its heart.